Microsoft has made it easier and cheaper to upgrade to the newest version of its Windows OS. Also once upgraded you may feel Windows 8 performs even better than your old OS on the same hardware. “We built Windows 8 to work great on existing Windows 7 PCs. And we also set out to make upgrading from Windows 7 to Windows 8 super easy,” said Reller. There has been a lot of criticism of the new interface with which Windows 8 users are presented. With this in mind Reller talked not just about the numbers but about other research into customer’s Windows 8 use. 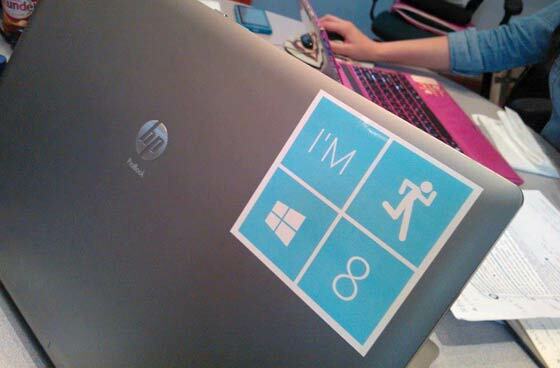 “When people experience Windows 8, they do find it is easy to get started and fun to learn. We know from the data we're getting in that customers do indeed get the product,” she said. Use of and personalisation of the Start Screen was noted and Reller added that the average user added 19 new tiles to the start screen interface in their first three weeks of Windows 8 usage. Other interesting figures forthcoming from Microsoft’s research are that, on their first use of Windows 8, 85 per cent of users use the desktop and about half of them visit the new Windows Store to look through and download apps. Tami Reller has only recently taken over control of the Windows Division from the departed Steven Sinofsky. During a Q&A at the conference she was asked how the Sinofsky departure has affected Windows development. Ms Reller responded that the Windows team and the product are in “great shape”. We would have liked to hear some Microsoft Surface sales figures but none were forthcoming. However earlier in the conference Microsoft said it had sold 750,000 Xbox 360 consoles during black Friday week in the US, a great figure but down from last year’s even more impressive 960,000 sales total for the same week. Ok, I confess that's way more than I expected, despite the low cost of entry. Pitching the price into “pocket money” territory clearly helped… as, no doubt, did the ability to cheat and get the very cheap upgrade. The prices (so we're told) aren't permanent though and so over six months we'll see how it really performs. It's difficult to judge though - on one hand the current pricing is very good but on the other hand 7 is very good and the economic climate is awful right now. Hard call but it certainly won't be the crushing failure some would have you believe imho. Windows 8 not so bad after all, ha! Windows 8 is going to sell because to Average Joe it is good, now he is touching Windows just like a phone or iPad/tablet (which sales prove Average Joes like a lot) - most people are so bad with computers the productivity slowdown some nerds/geeks/'techies'/ranters claim just isn't a noticeable factor because Average Joes can poke quicker than they can mouse. I dont think its a case of “customers get the product”, I think its more a case of that its so damn cheap.